What is Street Skills LLC? “Do one thing and do it well” is the Street Skills philosophy. What causes motorcyclists both fear and fun? Curves. These emotions intensify as the the curves get sharper. There are many excellent riding schools out there teaching a wide variety of skills and techniques. However, my school specializes in cornering confidence. If you want to attack curves fearlessly, register for limited course offerings at select rallies or invite me to teach at your event. I’m a private motorcycling skills instructor specializing in advanced cornering techniques. See full bio HERE. Where and when are Street Skills courses offered? I go where riders gather. 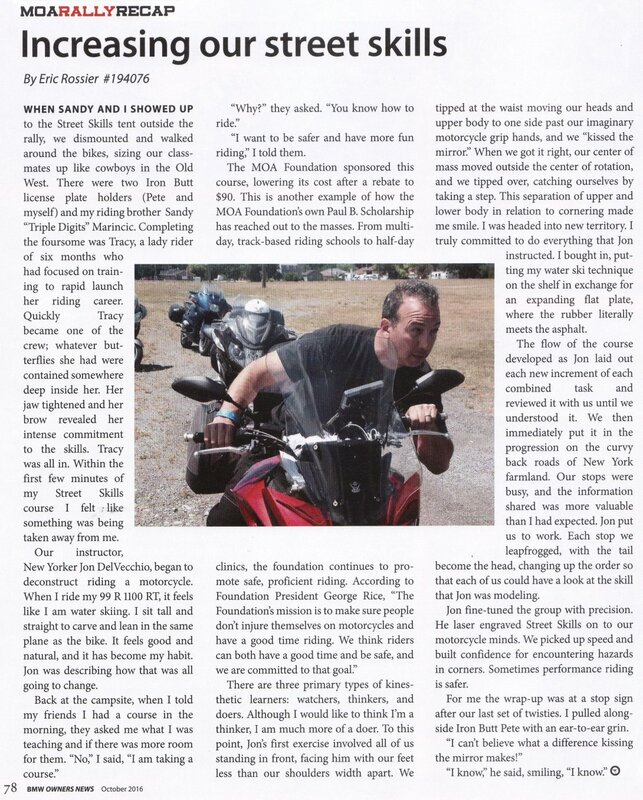 I’ve sold out on-road style courses at the last two BMW MOA annual rallies and taught street rider track days at the New York Safety Track since 2015. In 2018 I’m considering teaching on-road cornering confidence courses along the Blue Ridge Parkway and the Deals Gap area. Since I only teach a handful of courses per year, I schedule events on my calendar as early as possible. Specific MSTA events I may propose to offer courses at are: TriStar in NC, Mail Pouch in Ohio, Big Lynn in NC and Fall Colors in WV. Contact me asap if you would like to possibly attend any of these events so I can move them up the priority list. Sign up for the Street Skills monthly newsletterwith riding tips and school happenings. Visit the Street Skills website (streetskills.net) to learn more about the school. Lots of social media choices available to follow. Very nice Jon! Thanks for posting that up. I'd like to post that on the website as well. Would that be ok?